Leaving Osmaneli, we started our climb up to the main Anatolian plateau, heading for Ankara at 900m above sea level. A couple of days down we arrived at Eskisehir – a lovely (and surprisingly modern!) university city with a canal and riverside cafes and parks, tramlines, and western shops of all kinds. Even the people looked a lot more European than any of the other Turkish cities we have passed through – including Istanbul! After a one day stop there resting our weary backs (and both recovering from some minor ailments) we set off for Ankara, on the empty road spanning the vast and bleak Anatolian steppes. The road would have been almost like a desert road – had it not been for the 500 lorries an hour all belching out smoke and diesel fumes in our faces. Nic was happy though – as he had not packed his aftershave prior to leaving and now could get his morning splash of Eau de Diesel’. There were few towns on route with a distance of 50 miles in between – so we had to cycle well and efficiently to get to a safe place for our slumbers. That evening we arrived at Sivrihisar – which was shown on our map as a major town but turned out to be a largeish village with only one hotel (which was full). More importantly for Nic the town had one other thing that made it an undesirable place – it had no pastane (a Turkish patisserie house for breakfast munchies and coffee). Despite being so basic it was immaculately clean – surprisingly so for a student house – and Hasret made us very comfortable, even taking us to the best pide house in town, where Nic found the most sublime Turkish food ever – a Mevlana pide which is a Turkish pizza with cheese, little chunks of beef, and no tomatoes. Hasret lived in Ankara with his family and insisted that we come meet them all when we arrive in Ankara a couple of days later – so we did! We arrived in Ankara at early hours of the afternoon – proud of ourselves for having covered the 55 mile distance since the last town so fast. Alas it turned out that Hasret’s family lived on top of the highest hill of the city (1200m) so we spent the next 2 hours walking with our bikes up the steep hill, dodging the crazy Turkish cab and bus drivers. We met the family – mother Kezban, sister Adalet, and father Pasa, who welcomed us as if they had known us all their lives! We had a fantastic home cooked meal before collapsing into bed. 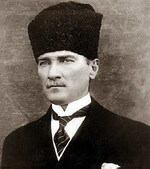 The next day (29 Oct) was the biggest public holiday in Turkey – celebrating the forming of the modern Turkish republic. The whole town was ablaze with the red Turkish flags hanging down from every balcony, and processions and celebration shows were held in the hippodrome and major roads of the city. Hasret and Adalet took us to the grave and mausoleum of Ataturk – the founder of the Turkish Republic and the first president. All her life Sedef had wanted to see both his place of birth (in Thessaloniki, Greece) and his resting place in Ankara, worshipping the memory of Ataturk like every Turk does. From the mausoleum we set off to a nice park outside of the city – alas we never got there as the car broke down on the way back. We were miles out of town with no public transport so a tow truck was our only means of getting back. However the truck could only seat 2 people at the front so the girls had to lower down the front seats and hide in the car (while it was being carried on the truck!) to avoid a fine!